From Clovis, California, this five-piece youth punk band pours out the street punk with a side dish of sing-along choruses. They're young, wild, and seem to represent all the ideals that sometimes get lost in the world of rock, which are play fast, party, have fun, and forget your troubles. And that's exactly what they do, they pour over the punk with youthful energy and an intense love of the music. "The Chase" demonstrates the street chops this band has, painting a clear picture of the fury, rage, and rebellious mayhem they're capable of. 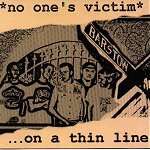 On the other hand, "Thin Line" shows just how melodic these guys can be as they serve up a sing-along chorus tightly packaged around catchy verses that will also have you repeating the words. "Raggae Clash" packs a rhythm-section boom, as the bass and drums hammer away at some intense beats that will floor you with sheer power. And on "Gun Shots & Cries," the band not only delivers one of the album's best, both in intensity and infectious-ness, but also proves they have the lyrics to back up the music. Shooting through the chorus with terror, sympathy, and an overwhelming sense of disgust with our society, the lines "When you looked into his eyes, was he really ready to die?/Gun Shots & Cries in the night/Was it just another fight?" tears a whole in you and brings you into the reality of society with a bang. As you sit there and contemplate it, singing along with the infectious chorus the band couples around the lines, you feel so much compassion and intensity it is hard to put the song out of your mind. Finishing off the album with some more street punk filled with melodic choruses, "The Bottle," "Always On Top," and "Omaha" put you in your place and give you the punk you're craving. When I first put in the disc I liked it, but wasn't taken by it. By track six, though, "Gun Shots & Cries," I was sold. After listening to it again with the certainty of liking it, they just kept me going with punk that was intense and not afraid to spit in your face, while making it melodic and fun enough for you to bounce around and sing-along if you so desired. I'll give this album an A-.